« Upcoming Bee Events – SAVE THE DATES! This weekend’s storm brought so much snow that I could actually ski to the bees. My neighbor, Amy, and I skied the Southwest Corridor to Forrest Hills where we met Amy’s colleague from work – and the three of us hiked up Weld Hill to the garden. I didn’t know what to expect since supplying the ladies with the candy board – and had a feeling of panic that they maybe ate every last bit of the 16lbs of sugar and were starving. It was a cold few weeks in early January. The garden was gorgeous- blanketed with at least 3’ of snow. With our skis we trekked over to the hive. I was sure I would see the ladies buzzing in and out- as the temperature was warming up quite a bit. But nothing – not a stir. I grew worried – it’s not a good sign if all is quiet in the Apis mellifera world on a warm sunny day – even in post-blizzard conditions. 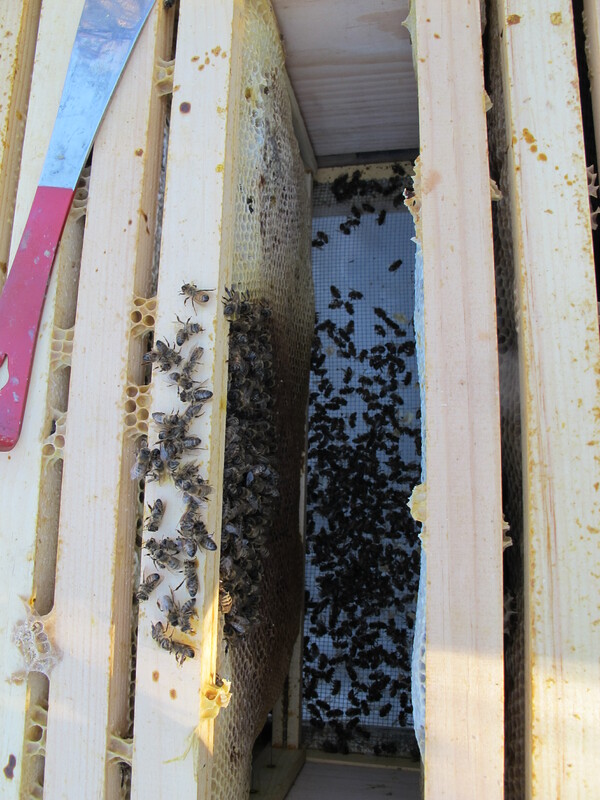 I brushed the snow off the hive, removed the bricks and opened the inner cover . The candy board was fully intact as if I put it in yesterday. My heart sank. This was clearly the worst sign – no one is eating – and that could only mean one thing. I lifted the candy board – and there was the cluster – albeit lifeless – balled around two frames – frozen in time. They indeed starved to death – but with 16lbs immediately above their domain and two full frames of honey inches away it was a total mystery to me. How? Why? The loss is an odd sting. Certainly there’s disappointment, followed by blame – and at some point an internal debate trying to rationalize that they’re just insects. And, yes, they are insects that you rarely have control over – but they are also a beautiful living system in my charge. There’s so much I learned from them through observation, maintenance, care – and the patience I gained was a gift (not to mention the honey, pollen and wax!). No matter how I think of it – it’s a sad day when your hive dies – and it took a few days to really sink in. As a whole – the Apis mellifera are suffering tremendously. Hives are dying at an alarming rate. My apiary mate lost her two hives earlier this winter, a beekeeper I know in in the suburbs of Boston lost over six hives this winter (he keeps 10), and similar stories just go on and on. The bees are weakened by a whole host of threats: diseases, pests, environmental factors, perhaps even the industry (of bee breeding) itself. The only thing to do is to keep keeping bees. I had quite the year with my loss and gains between Mavis and Sally – and have certainly learned a ton. Of course I will continue. To be honest, I anticipated the loss. I had placed an order for two nucs [a nuc is a small bee colony established from a larger one – it consists of a few frames with brood, worker bees and their Queen] from a farm in Northern Vermont on New Year’s Day – one to replace Sally – and one as ‘insurance’ should anything happen to Mavis. Mavis was pretty weak in late fall, and the chalkbrood didn’t help. I’m curious to see if the Vermont ‘stock’ of bees is hardier – Mavis and Sally came from Georgia – where most hobbyists get their bees. Obviously my southerners didn’t adapt too well – so I’m thinking overwintered nucs with naturally mated VT Queens might be stronger. We’ll see. 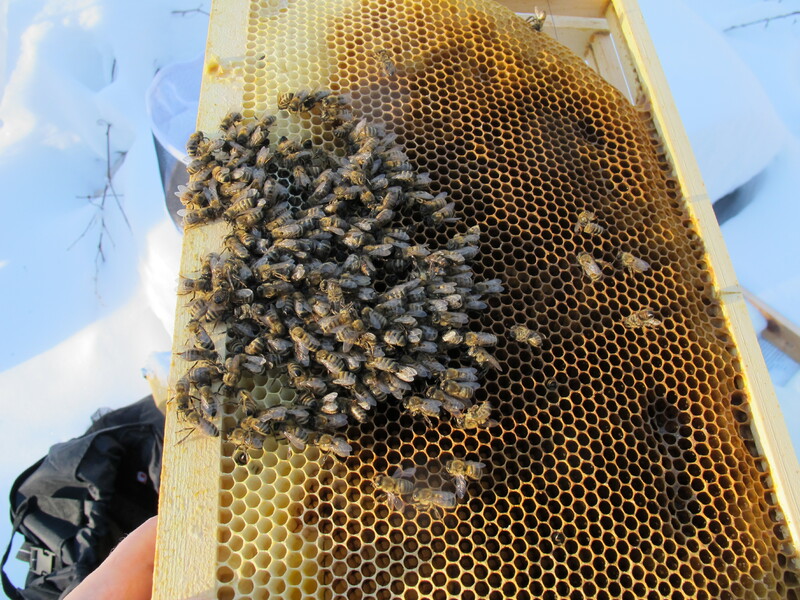 For now the hives are quiet, empty – awaiting the potential of spring.